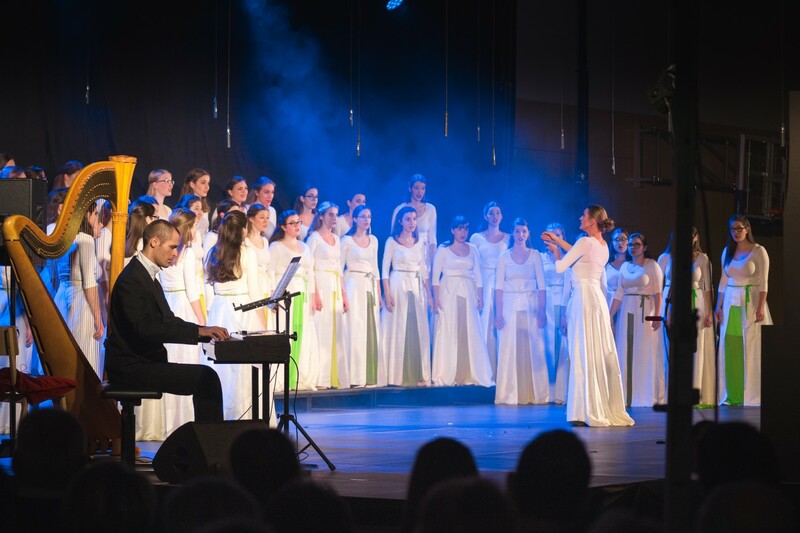 The gala fundraising concert of St. Stanislav Girl’s Choir of the Diocesan Classical Gymnasium which took place on 4 January 2019 started with a welcoming song: God grant us a good evening. Indeed the evening was grand in all perspectives from the singing girls, conductors, repertoire, soloists, the Alumni orchestra to the eloquent and amiable programme host Jure Sešek. The above mentioned choir is the only European choir to be invited to perform at the 2019 American Choral Directors Association Conference in Kansas City, Missouri, USA. The full house enjoyed in particular the femininity of the choir in its best sense of the word: gentle, yet strong and determined in their music expression, the girls presented a part of American programme which coprised impeccable singing, imposing sound and complex choreography matching the melodies with great precision. We listened to an appeal for peace in Močnik’s Jerusalem; accurate merging of movement and sound in Jennefelt’s Noviori Ani; Makaroff’s melodious perception of human transience in the image of a Butterfly’s life’s brevity and finally an energetic and playful stamping of feet and clapping took place in the piece And so we dance in Resia. In the short interview the conductor Helena Fojkar Zupančič said that the hard work is mostly over. “Now it is time for pleasure and we all feel the joy of anticipation”. Gloria Ema Glas, the girls’ representative did not complain about numerous rehearsals, but expressed her enthusiasm for the opportunity to set off to Kansas City. “If I did not sing in this choir, my singing would not be that good and my personal growth would be underdeveloped. Friendly relationships in the choir boost excellence.” She spoke thankfully about the strong impact Helena Fojkar Zupančič has on the girls. The evening was rounded with some solo singing by prominent guests and the premiere appearance of The Diocesan Classical Gymnasium Alumni Orchestra under the baton of Jera Petriček Hrastnik and her assistant Matija Krečič. Special thanks go to anybody who has participated in whatever way for this concert to be a huge success. In particular sincere thanks go to the sponsors, whose generous support is truly appreciated.